Far from the snobby image I once associated with sailing, the boating community is just that – a community. “No way are you going to be able to stay on your boat ‘on the hard’ [when a boat is brought onto land, generally either to be worked on, stored or both]. It’s too hot and dusty. Come stay at our boat – we have a forepeak cabin with its own bathroom. 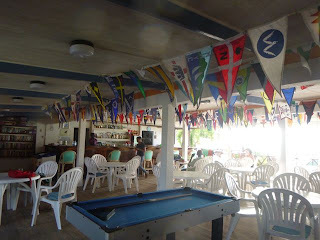 If you do decide to stay at a hotel, be sure to check with the marina to see if you can get any hotel discounts through them, “ advised Ilsa, a fellow Rodney Bay yachtee. We felt truly really touched by such generosity from a near stranger. “It’s just what yachtees, do,” Ilsa countered, casually brushing aside our heartfelt appreciation of her offer. We met Ilsa and her husband Svein when fellow Rodney Bay Marina cruiser Gary invited us to his “Sundowner” (here, that’s byob drinks and hosted nibblies). Gary came by after we introduced ourselves as “new arrivals” on the local cruisers “net.” Cruisers nets are VHF radio-based community information exchanges. The Rodney Bay St. Lucia net was started 20 years ago; we were invited via the net to attend the 80th birthday party of its founder. “Stick,” a local electronics wizard and live-a-board yachtee currently hosts the Rodney Bay Marina net. 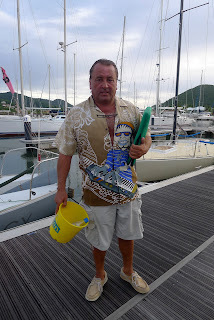 His program covers weather, arrivals and departures, ride shares, “treasures of the bilge” (stuff yachtees want to get rid of from their boat, but figure might be useful to someone else in the community) with an open forum for special needs. We look forward to making our contribution to the community, beyond sharing the “treasures of the bilge” we announced on the local net.